Welcome to the first of my weekly The Americans episode reviews! I can’t wait to spend the next few months talking about KGB agents, family dynamics, and Martha’s gun with all of you! “EST Men” was an episode that asked a lot of its leading lady—physical fighting, verbal sparring, physical pain, emotional pain, warmth, stoicism, vulnerability…And Russell delivered, with what was perhaps one of my favorite hours of work she’s turned in yet as Elizabeth Jennings. At the center of it all was her relationship with her daughter and her mother. 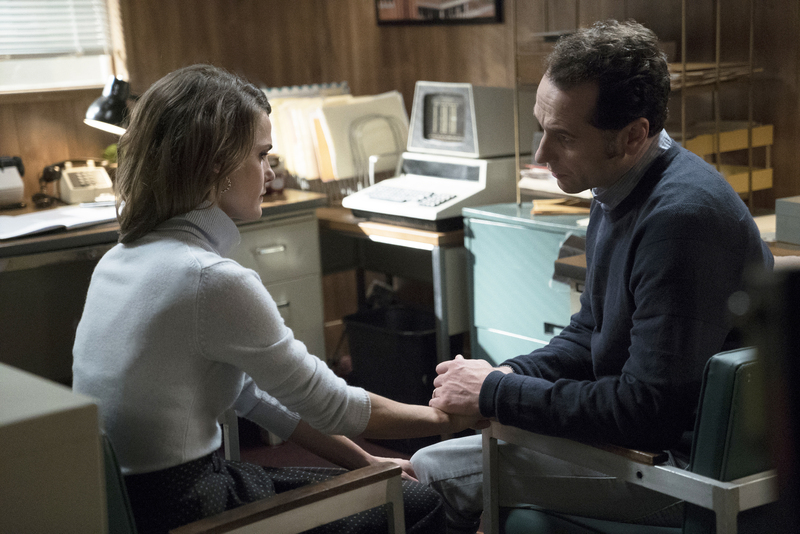 In typical The Americans fashion, there’s no one way Elizabeth’s bonding with Paige can be viewed: She talks to Gabriel about Paige as an agent, and she talks to Philip about Paige as a mother—and she is both; she can’t separate one from the other, and Russell is balancing those two facets of Elizabeth’s relationship with Paige brilliantly. The beginning of the episode framed Elizabeth’s mindset perfectly; she believes in the value of being thrown into the deep end, most likely because that’s how she was raised. And for as difficult as her own childhood seems to have been, she still loves her mother incredibly. That much was heartbreakingly clear in the scene where she listened to the tape of her mother telling her that she was dying. Russell’s work in that one scene was so good that I want to give her an Emmy nomination for it right now. We didn’t need subtitles to know what was being said; all we needed was Russell and her incredibly expressive face. The way she was able to allow us to understand the emotional weight of a message delivered only in Russian just by subtly changing her expression was everything that’s right about the acting on this show. Russell was so good in the episode’s big moments—the fight with the FBI agents, the meeting with Gabriel, the fight in the car with Philip—but where she excelled was in moments like the one with her mother’s tape: moments that demanded the kind of quiet nuance only this show delivers on such a consistent basis. Playing physical pain isn’t easy; it’s often done through too much overacting. But Russell made me truly believe Elizabeth was in incredible amounts of pain after her fight by not trying too hard to show me how much pain she was in. And by the end of the episode, Elizabeth was also carrying around incredible amounts of emotional pain after learning of her mother’s illness. The scene between Elizabeth and Philip in their office at the travel agency was handled with such quiet depth from Russell (who was met every step of the way by her great scene partner Matthew Rhys). From the gentle way she opened the wrapping on the brownie to her hunched posture as he reached out to take her hand, Russell showed Elizabeth’s exhaustion and vulnerability through small physical details that said so much. All I wanted to do in that scene was reach through my TV and hug Elizabeth, and if this episode is a sign of things to come this season, then I’m ready to start my “Russell for the Emmy” campaign now. The Americans is so good at creating scenes where a thousand things are happening under the surface and the tone shifts as different characters enter and leave the frame. The scene where Elizabeth’s time nursing her wounds is cut short by Philip bringing Stan into the kitchen was one of the best examples of this layered emotional storytelling. The scene began with Russell giving a master class in how to play injured with almost uncomfortable realism. What I loved about Elizabeth’s icepack and blood in the sink was that it showed a new kind of vulnerability for her character. So often on shows that feature characters in physical fights, they never seem to be injured afterwards. However, The Americans has always been a show about the humanity and vulnerability in even the coldest and most well-trained spies, and Elizabeth isn’t a superhero; she’s a woman who can bruise and bleed and ache. Then, when Stan and Philip entered the scene, the tone changed from one of quiet vulnerability to tension. I loved watching Rhys in this scene. Elizabeth and Philip might be at odds when it comes to Paige, but they’re still partners on a very deep level. And it was amazing to watch their silent conversation unfold as they joked with Stan about Philip doing groceries. Their serious, intense gazes were such a perfect contrast to the jovial tone of the conversation. When Philip got Stan to leave, I actually sighed in relief out loud. With Stan out of the house, Philip and Elizabeth could do what they’ve come to be able to do with only each other—let their guards down. It was a lovely representation of the fact that—despite the new divide between them—they have a level of intimacy with each other that no other relationship on this show has achieved. And the blocking of this quiet moment between them reinforced the idea that this level of intimacy has grown so much from the show’s pilot. In that episode, Philip tried to kiss Elizabeth in the kitchen, and she turned on him with a knife. Now, in that exact same location, Philip kissed his wife gently on the back of the head, and she moved to have him hold her tighter. Elizabeth let Philip see her wounds, and she let him comfort her. That’s no small feat for these characters. And, as the conflict between them involving Paige grew deeper in this episode, I loved having this scene to balance that sense of conflict. Yes, they’re on opposite sides of this huge debate, but they also still love each other deeply. Nothing on The Americans is ever simple, but that’s what makes it so compelling. Philip and Elizabeth’s relationship is a prime example of that compelling complexity. • If this episode is any indication, I am going to lose a lot of sleep in the coming weeks over Martha and her gun. • Elizabeth gets beat up on the job, and Philip gets some loving from two different ladies. (Of course Martha would want to try Karma Sutra.) This seems pretty unfair to me. • It looks like this season will continue to see me obsessing over Oleg. When he told Arkady that he begged his father to help free Nina, I actually got tears in my eyes. • One episode without Nina was survivable, but I need her back ASAP. I did like how the shadow of her conviction hung over both Stan and Oleg in very tangible ways. • Frank Langella was the perfect addition to this cast. It was also incredibly fun to see Elizabeth and Philip with a kind of father figure. There was a lightness to them that was so new for these characters and yet felt incredibly realistic for two people who had to grow up and live on their own as quickly as they did, with only their handler to lean on. • Paige’s hair is starting to rival her mother’s in its beauty. • For as much as I didn’t like seeing Philip and Elizabeth apart for so much of the episode, it really helped their growing divide hit home. • Anneliese’s death was really difficult to watch, especially knowing Philip was listening to the whole thing. Watching Philip get more blood on his hands was a great reminder (along with Elizabeth’s fight) that it’s not supposed to be easy for us to root for Paige to find out the truth and become a spy. There are good reasons for Philip to be against it, even it means betraying his country (and his wife). He wants to protect his daughter’s innocence (and her life), which goes directly against Elizabeth’s “into the deep end” parenting style. What an incredible start to the season. Keri Russell continues to amaze me with her portrayal of Elizabeth. I loved the scenes of her at church with Paige. Part of being a spy is knowing that the people you love can be used against you at any moment and knowing that you can never fully reveal who you are to those close to you. If Paige is recruited by the KGB, it’s one less person for Elizabeth to hide from and lie to and as she’s allowed herself to be close to Phillip, that closeness is something she wants more and more of. It’s given her an excuse for that closeness. She got to be the protective mother looking on as her daughter interacts with a boy she might like and got to enjoy her company. Paige wasn’t a liability any more, she’s an assignment and one Elizabeth enjoys. This is why I’m so happy to be writing about this show this season. You brought up such excellent points about Elizabeth and her relationship with Paige. I think you’re so right that letting herself love Philip and open up to him completely has helped her see that she wants more of that in her life—that honesty and closeness with another person has been so good for her, and I think she’s never really had that before. And she sees the potential to have that same kind of open and honest relationship with her daughter. What makes this show so wonderful is the moral complexity of that. On one hand, of course I want Elizabeth to be able to be honest with her daughter and for Paige to know the truth about who she is and who her parents are. On the other hand, I don’t want that innocent, beautifully altruistic girl anywhere near the kind of work her parents do in the name of their beliefs.